Meet the winner of this year’s Joan Anne McHugh Award. Bahaa Barsoum, R.N., has an uncanny ability to see great potential in people, even when they don’t see it in themselves. The director of nursing (DON) at A.G. Rhodes Health and Rehab in Atlanta, GA, says it’s really no big deal. He’s simply repaying the debt he owes to dozens of people who cared enough to push him outside his comfort zone throughout his career. Now, he’s simply pushing back. Barsoum credits his father with encouraging him to enter a field where he could follow his calling to help people. Barsoum had already earned a bachelor’s degree in business after a post-high-school stint in the U.S. Army. But he quit his job soon after that heart-to-heart talk, and applied for a certified nursing assistant (CNA) position at a nonprofit nursing home near his family’s home in Troy, NY. With similar encouragement from supervisors and colleagues, Barsoum climbed the long-term services and supports (LTSS) career ladder over the next decade, becoming a licensed practical nurse (LPN) in 1996 and a registered nurse (RN) in 1998. He moved up from assistant director of nursing to director of nursing when supervisors assured him he would excel at those jobs. Barsoum credits his wife with pushing him to apply for his current job at A.G. Rhodes. His Atlanta colleagues nominated Barsoum for the 2017 Joan Anne McHugh Award for Leadership in LTSS Nursing, which he received at this year’s LeadingAge Annual Meeting. Bahaa Barsoum, R.N. (right), with A.G. Rhodes resident Opal Chase. Photo courtesy of A.G. Rhodes. Barsoum recalls falling in love with A.G. Rhodes when he went for his interview. That love affair has continued for 9 years, a record-breaking tenure for a DON. “At A.G. Rhodes, I have become the kind of director that I wanted to become,” he says. Barsoum’s kind of DON spends a lot of time on his feet, and very little behind a desk. He’s often seen bounding through the building where he works, chatting with one of the 138 residents who live there, joking with CNAs, or pitching in to administer medications or provide personal care whenever an extra hand is needed. 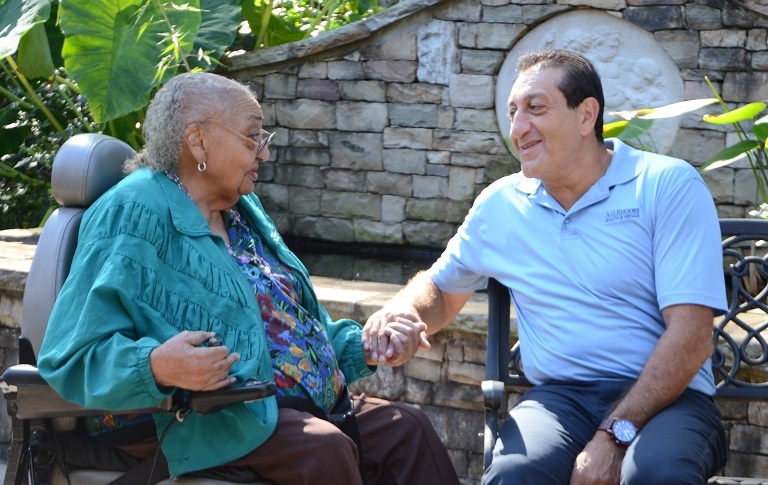 Building a strong rapport with team members and residents isn’t just an enjoyable pastime for Barsoum. It’s a deliberate strategy that he says has helped A.G. Rhodes achieve and maintain its 5-star rating, and enjoy an impressive series of deficiency-free surveys. Getting out from behind his desk also helps Barsoum observe his team members in action, and gives him the opportunity to do what he does best: devise strategies to help CNAs and nurses move up the LTSS career ladder in the same way he did. Team members have learned never to underestimate Barsoum’s power to persuade. In the past few years, he’s encouraged 8 LPNs and 4 CNAs to become RNs. He’s particularly proud of his success in encouraging a CNA to become an admission’s assistant at A.G. Rhodes, and convincing a nurse on the night shift to apply for a daytime nurse manager position. These days, Barsoum’s attention is focused on implementing some of the person-centered care practices he observed during a 2016 trip he took to the Netherlands as part of an exchange program between A.G. Rhodes and Marga Klompé, a non-governmental organization that operates nursing homes and assisted living communities. When Barsoum returned home, he led efforts to introduce a more person-centered model of care at A.G. Rhodes. For example, residents now go to bed and wake up when they want. Barsoum purchased several tubs for the building when residents expressed the desire to bathe, rather than shower. And, after conferring with families, Barsoum advocated for the right of residents with mild dementia to walk around the building if they wanted to do so. At first, team members were concerned about the new freedoms, says Barsoum. He responded by reminding them that they were working in the residents’ home. Barsoum attributes the initiative’s early success to a strong team that adjusts quickly to change, and to his own willingness to involve team members in planning how changes would be implemented. Barsoum still makes the final decisions about policy and practice, and sometimes he and his team “agree to disagree,” he says. But usually the team works together to tweak an implementation so it is more likely to work. That collaborate spirit will come in handy A.G. Rhodes takes person-centered care to the next level. In the end, says Barsoum, being a good DON is a delicate balancing act that begins with a strong team and a good mix of residents. From there, the key to success boils down to relationships. He takes prides in knowing residents and their families, “sometimes better than the nurses do.” He shows his respect for team members by maintaining good staffing levels, and making it known that he’ll cut them some slack if they occasionally need to arrive a little late or bring children to work in an emergency. Geralyn Magan is a writer with the LeadingAge LTSS Center @UMass Boston, and has been writing for LeadingAge for more than 3 decades.